Today is Election Day and I just wanted to take this opportunity to say thank you. As the primary campaign comes to a close, please know that I appreciate your answering the door when I knocked, I'm grateful to those of you who hosted me in your home, who joined us at sign waves, to those who donated to the campaign, and to the many of you who volunteered at Early Vote sites and are staffing polling places today. To my old friends, and all of the new friends I’ve made over these past four years, thank you for being so unbelievably generous with your time, energy and support. Today is important and it's your chance to be heard. 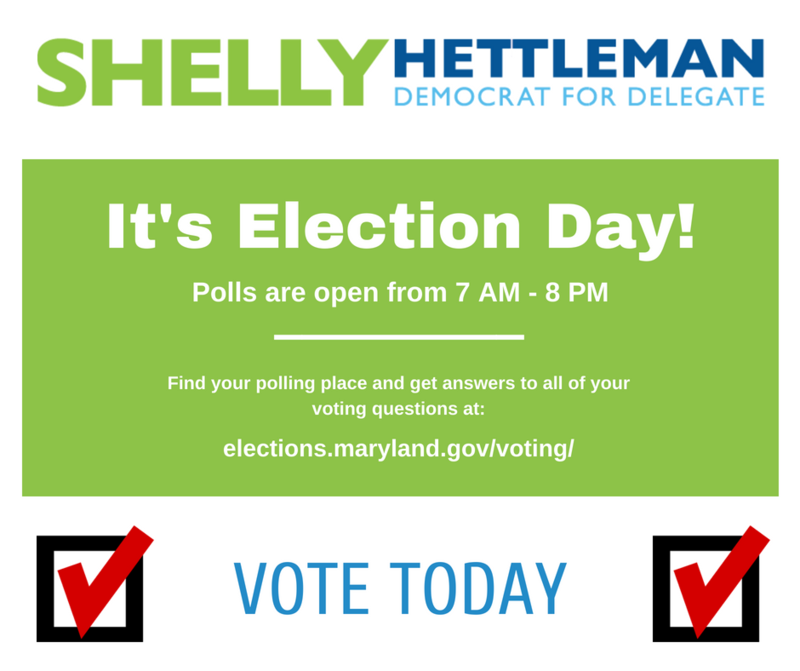 The polls are open until 8:00 pm and you can find your polling place here. If you tried to change your party affiliation or your address through the Motor Vehicle Administration, there may have been problems. If you need to cast a provisional ballot, be assured that your vote will count, but to understand more about voting provisionally, please click here. I’ve really enjoyed representing our community in the General Assembly and I'm proud of what we've been able to accomplish. There is so much more to be done and I am hopeful that, with your support, I will be back in Annapolis advocating for the 11th District. I am more excited than ever at the prospect of continuing to represent you in Annapolis and could not have made it this far without all of your support and encouragement. P.S. All the best to my District 11 colleagues, Sen. Bobby Zirkin & Delegate Dana Stein -- we've worked together well for the 11th District! !